As a avid book reader, you always want to read many books in less time. At the same time you want to also enjoy reading books and do not want to just skim through it. There is only one way we can read more books - read faster. How do you read faster? Well its not easy however you can learn how to read fast by cautiously using few techniques while reading. Increasing your reading speed is not the same as speed-reading. As you will discover, speed/skim reading is not real reading, it is just a way of getting the gist of a piece of text. Here you learn real and genuine ways to increase your reading speed, but as with most things, it takes work and practice. Increasing your reading speed cannot be done overnight. There may be tips and advice out there to help you increase your reading speed, but the fact is you are still going to have to practice. People that rarely read books are the slowest readers…it is just a fact. You need to find time to read books instead of Facebook posts. Find time to read books that interest you. The science behind speed reading tools is that your brain can process words faster than you are actually reading them. Speed reading tools force you to read words, which your brain then puts together in your mind. Be aware that the tools listed here are not going to help you speed read; they are going to help you increase the speed at which you read. The only problem with speed-reading tools is that if you take your eyes off of the screen, then it is difficult to get your place back. With regular text, you can jump back a line or two, but with a speed-reading tool, you have to rewind the words. You can use the tool if you want to read something a little faster, but the goal is to help you recognize that you can read faster than you actually do. 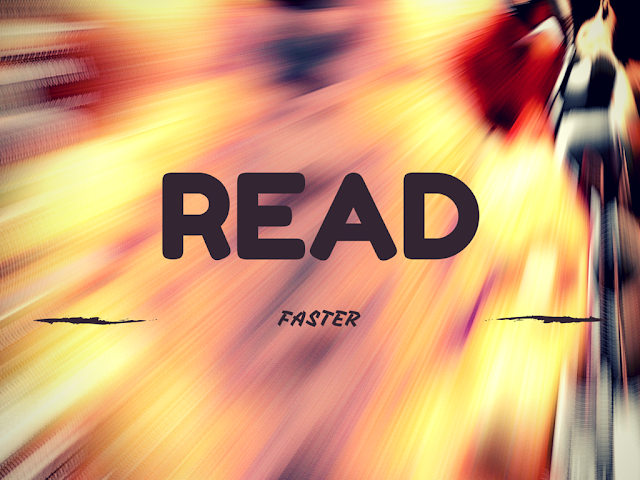 Using a speed-reader “may” help you get into the “habit” of reading faster. Getting into the habit means you don’t consciously try to increase your reading speed – you just do it. Here are four online speed-reading programs you can use online for free without having to sign up for an account. Watch the videos or read the descriptions on each. Give each one a chance because each is of a very high quality. The reason four have been listed above is because you will prefer one over another. Try them all and pick the one that feels the best or that suits you the best. Everybody is different, so there are four speed-reading options. This may sound like a faux-pseudoscience-feathery-plop-trot piece of advice, but try it first before you smash your screen in anger--because this concept works. This tip is based on numerous psychological motivators, though the explanation for why this works is debated. Have you ever watched a few episodes of a TV show over a few hours or a few days? Have you ever immersed yourself in a TV show and found you started talking with the same accents as the people on it? Ever watched a lot of documentaries about serial killers and considered it yourself? Ever watched back-to-back videos of people like Lewis Black or Bill Burr and found yourself slightly more prone to angry outbursts? We seem to take on elements of what we immerse ourselves in. Read two pages of a book. Do not try to read faster or slower, just at your normal pace. Now, look up a TV show called “Rising Damp”. You can find episodes on YouTube and Daily Motion. Watch one or two episodes and go back to your book. Have you noticed you read a lot faster for some reason? If you do not like the show, then watch videos called “Zero Punctuation” on the escapist magazine website. Watch a few of them and then try reading. For some reason your reading speed has sped up dramatically. Sadly, it is only temporary, but it does show that you have the capacity to read faster and that you can consciously increase your reading speed. There is enough scientific proof to now prove that speed-reading dramatically lowers comprehension of the text by around 50%. Speed-reading only gives you a way to get a rough idea around what the text is about. (Skeptics Diary, 2013). Speed-reading doesn’t help you fully understand what the text is about, and any courses that claim you will are lying to you. Courses that brag you will be able to read hundreds of books in a matter of months are lying to you. The people that use skim-reading or speed-reading techniques are only getting a rough idea of the text is about; they have not really read the text. This tip is impossible for some people; nevertheless, if you want to give it a try, here is an exercise you can use. Read these lines and say the words in your mind (as you probably do anyway). Dreams the world far away. In this cruel children's game. There's no friend to call her name. Now, think of a tune in your head, preferably one that doesn’t have words to it already. Lots of TV shows have theme tunes you can use that do not have words to them. Using that tune, re-read the paragraph about Eva, but instead of saying the words in your head, sing them in your head to the tune you picked. Did you try it? Difficult, wasn’t it? Now, try it again, but say the words in your head to whatever tune that fits the words – just make sure you are saying them in your head to a tune of your own making. Try it? It was a little easier wasn’t it? But, did you notice that it still took longer than trying when you normally say them in your head? Now you have read the Eva paragraph three times, some of it should be committed to memory. Try re-reading the paragraph but try not to say the words in your head. Look at the text and move your eyes across it as if you were reading – but do not say the words in your head. What is the point of this exercise? The point is that by singing the words in your head, instead of just saying them in your head, you are made consciously aware of the fact you are saying the words in your head. Once you are consciously aware of the fact you read the words aloud in your head, it makes it easier to read exclude them as you read and stop saying them in your head. You will need to try the singing and silent trick a few times before you get the hang of it, but if you commit and practice, then you may learn how to read without saying the words in your head, which will increase your reading speed. Hope these fast reading tips may help you improve your reading speed. Linda Craig, writing enthusiast and a professional editor at assignment writing assignmentmasters.co.uk. Her passions are modern British Literature and digital education tools. This is delightful vibrant content and articles. People are pretty much cheerful approximately should never decent works out. Just about anyone nestled unquestionably advisable statistics. Maintain. Shield making a fabulous web page. Already follow here kitchen remodeling weschester county About to viewing here page.